This is an excellent choice for making your candles. You'll save time and money. EricX Light candle wicks for candle making are created using all natural material. No chemical treatments. No contain lead, zinc or other metals. This high-purpose metal bases and wooden candle wicks provide amazing economic value. Buy now! It will become a way of regulating the pleasures of life. At least you can make 20 candles at one time. 1. Please NOTE make sure soak the wicks in wax 5-10 minutes before making candles. It's better to dip the wick in wax before for better flame. 2. Please be cautious with dosage of dye and scent whilst making candles,excessive dosage might influence burning effectiveness and reduce the candles ability to stay lit. 【Natural wooden candle wicks】Friendly to environment and no harm to human. It burns stably with no residue. No chemical treatments. No contain lead, zinc or other metals. The wicks are made of natural wooden material hence the minor color difference between every wicks. 【Amazing New Design】The cross-shaped wooden candle wick is our own patent designed, which can provide a smooth and thorough burning experience and makes the wooden candle wick lift even stronger. 【Efficiently burn all waxes】Paraffin, soy and more. 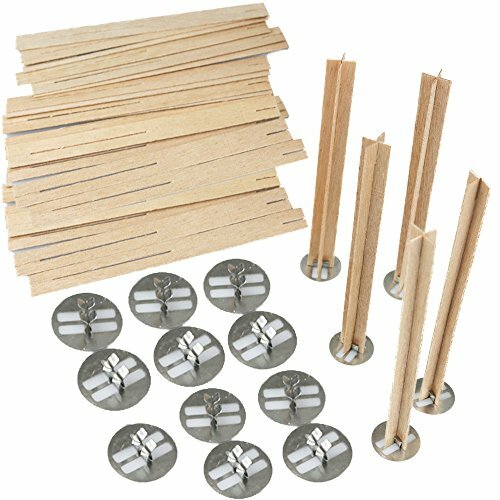 No matter which type of wax you choose, these wooden wicks are the perfect choice for your candle making. 【Product Feature】 Each pack contains 20 sets cross wooden candle wicks. Wooden wick's Length: 5 inch, Width: 0.6 inch. Metal Bases's diameter: 0.9 inch. Whether you run a handmade store or make candles for sale or gift, these are your best bet. If you have any questions about this product by EricX Light, contact us by completing and submitting the form below. If you are looking for a specif part number, please include it with your message.